Read this great and lengthy note on illiteracy in Pakistan and understand its causes, impacts and find its solutions. Illiteracy has been defined as reading a paragraph of a language with understanding according to the census of Pakistan 1981. The literacy rate is about 45% and the rest of the people 55% are illiterate according to 1998 census of Pakistan. Those people who are well-informed in modes of life are called educated. But illiterate are those who cannot read a paragraph in any language with - understanding. The difference between literacy and education is clear; In common understanding the educated people are those who have received formal education in educational institutions. But actually the educated people are those who understand the modes of life. Illiteracy covers the maximum number of population in which the higher age group people fall. They have crossed the age of 40 and more. There are the people mostly living in rural areas and have their rural profession related to agriculture. With the advancement of mechanized farming the labor force in rural areas became unemployed and some people are shifting to urban areas for job. Again these people are unemployed in urban areas facing problems of residence and employment. Moreover, those who are literate are unable to get employment due to shortage of jobs. Illiteracy is the problem when the people are unable to under stand new policies in agriculture which give poor yield per acre. Illiterate people are mostly familiar with old methods of cultivation and feel hesitation in adopting the new ones. Illiteracy is a problem because the national target could hot be attained by which self-sufficiency in food could not be achieved. Illiteracy is a social problem because maximum number of people are in this condition and they are unable to understand the new techniques of social life. They remain behind in raising their standard of living. They are mostly, poor. Illiteracy is a social problem because such people are irrational in attitudes and in emotions they commit such acts which are violation to the rules and laws of the society. Illiteracy, is a social problem in view of failure in understanding the methods of life, the religious knowledge and values and the general information on social progress. The roles they play in life without such information and knowledge are least useful. The most common cause of illiteracy is our traditional culture based on pure agricultural, profession in which education is not considered to be a foundation of life. Mostly, the cultivators have been illiterate people through out centuries in the history of our social life. It was considered that .if a boy become highly educated, he will become useless for the farms. it means cultivation of land and education is considered opposite concepts in our agrarian society. different fields of agriculture. Some are cultivators and some are helpers to the cultivators. Therefore, the tendency towards education is not favorite concept among the residents of rural area. A student put to school and college is considered to be useless for them. Moreover, they say that he will neither get employment in offices nor he will be able to cultivate the land and thus his life shall has been destroyed. cost of education is increases and becomes unbearable for parents as he gets promoted. are illiterate in rural areas. The people of rural areas dislike women to be employed in any government or private office. A woman is preferred to be a good wife, a good mother and a good daughter, if she works within the family. Now a change has come into the social structure of rural life that an educated girl is liked to be married as a wife but working within the household duties. This education is limited to school and the Holy Quran. The first question which is asked by the parent of boy is that can the girl read the Holy Quran and is a follower of prayers and understands the religious values? Most of the parents are illiterate that is why they do not like to send their children to schools specially the daughters. In urban areas this percentage of illiteracy is also higher among the women than that of men. The cultural value of Pakistani society dominate both in rural and urban areas to restrict the women within the boundary of the house. Another important factor is that people are attached with these ancestral profession for a long period of life and a son is expected to follow the same professional activities which his father is doing. It is a matter of prestige to work in farms as his ancestors used to do. It means professional activities are handed down from generation to generation and it is considered to be a cultural tradition of the family. their crops finding little time to visit cities. Moreover transport facilities are not personal which is a hindrance is social change. Lack of facilities like educational and the new environment of technology important cause of illiteracy. Another very important people of rural areas see educated young men employment. Then they think that what is the use children to schools and colleges. The social relations with other people, with transportation and telephone are limited that is why change in their attitude and behavior towards education is limited. Illiteracy minimizes social relations in society which leads to less development of resources. Illiteracy is itself a barrier in the social progress among people for better standard. Illiteracy itself is hurdle in understanding techniques for advancement and progress. An illiterate person is given less prestige while sitting with other people. He is given only a labor work and not allowed to sit on table .and chair in offices. He is considered to be at low class in society by the educated people because he is poor and illiterate. Illiteracy creates deprivation among people to enjoy recreations of the society. Illiterate person is unable to read books, magazine, articles, and other reading materials.He cannot participate in forums and platforms of educated people. Illiterate people are unable to deal with the social situations in a better way. In such kind of situation, their attitude is abnormal and some times deviant too. Illiteracy cerates backwardness among the people. Illiterates are unable to understand and its solution. There Is a relationship between level of educational attainment and income. Generally speaking, it is true that the more you educate the more you so earn illiteracy creates poverty. Illiteracy hampers social change because illiterates do not like social change. They want to live with their existing environment. Any change in it is resisted by them. Illiterates commit more crimes than the educated people. Educated people commit organized crime with latest techniques which illiterate do not violent attitude is more in illiterate than the literate persons. Due to above mention point, illiterates enjoy poor quality of life, and their status in the society is also poor. To bring these illiterate people into the lines of progress, advancement and change it is necessary to aware them about problems and consequences of illiteracy as their problem. They Should be provided information through mass media of communication and general social contact with the educated people about impacts of illiteracy. Illiterate people can be drained into channel of progressive people with attitude change through Showing movies, lectures by officers and programs of literacy on radio and television. These people can be given incentive of prize, if they take classes of literacy in the union council offices or schools of the Village. Those people who attend to this literacy program can be provided stationary and books free of cost. The time of teaching and learning can be fixed in the evening of the completion of their work. Four to six weeks teaching is sufficient to make them literate as to read and write the basic things of their need. This can be continued up to another two to three weeks at their homes on their interest. The people who are illiterate say that what is the use of this literacy and education for us because we are in the last stage of our age. Our argument is based on the fact that their literacy will be helpful to educate their children. They will feel importance of education and will educate their children at any cost Those young men who are quite illiterate are wasting their costly time of life without less output of their works whether it may be in farms. The literate people can utilize new techniques of agriculture with better results. A revolution can be brought up in rural economy and social life if literacy percentage rises at the level of urban area. They Will be able to provide better life and good sanitation and health occasion within their household life. It is the mind, which changes first and then it brings changes in the total of social life. Change of mind is the change of general social life. And the mind cannot be changed until the education is not given to the people. Education is the injection of change and progress. The use of radio, television”, newspapers and the mass media of.communication are the aiding sources for the acceptance of education for progress. 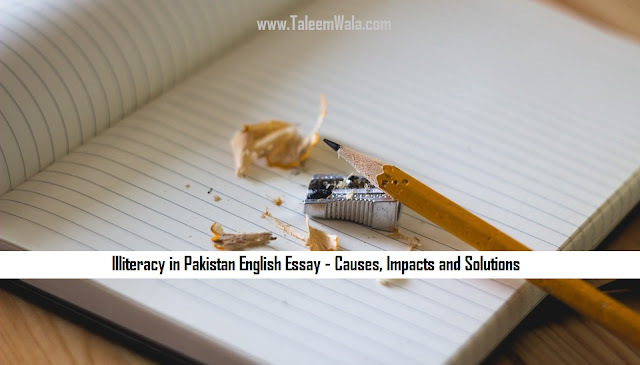 If you want us to upload more English essays and educate more Pakistani students then share this with your fellow students and stay connected.